Do you feel creative? Do you want to write your own poem? Perhaps you would like to just write down your thoughts... it doesn't have to rhyme! Here's a chance to showcase the feelings you have been wanting to express. 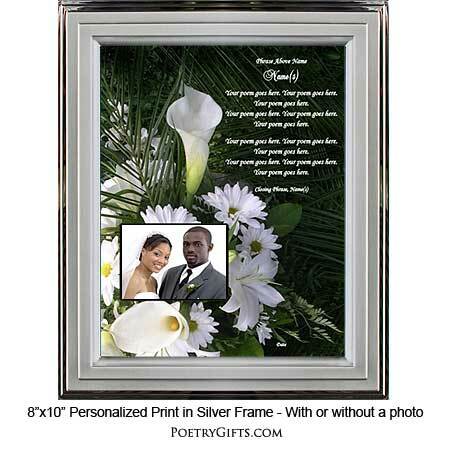 Just type them below and our designers will create a one-of-a-kind gift for you in this striking calla lily design. Calling all "Closet Poets!" Here's your opportunity to put into words the feelings and emotions that are in your heart. Maybe you want to write a love poem to your husband or wife letting them know what they mean to you. Or maybe you have a special anniversary coming up and you want to tell your spouse how happy you are to share the good times and the bad times with them. 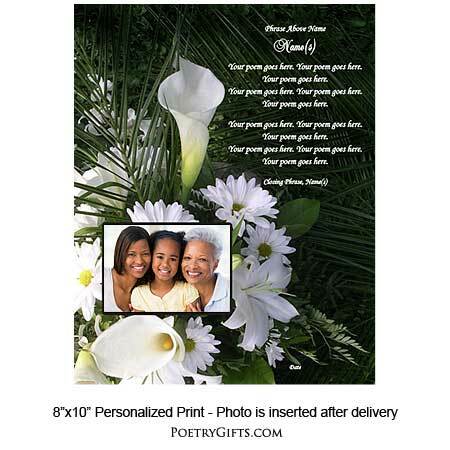 Another great occasion for you to write a poem would be on your son or daughter's wedding day letting him or her know how proud you are to be their mom and/or dad. Just imagine how your "special someone" and family members will feel when they know you took the time to write a poem just for them and had it personalized with their name(s) and a closing message from you. You can't put a price on a one-of-a-kind personalized gift that will mean so much! 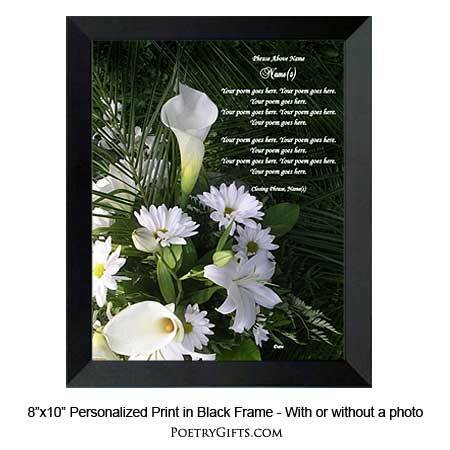 Want to make your Poetry Gift even more special...insert a favorite photo in the cut-out photo area. 3. Closing Phrase and Your Name(s) (as seen after poem) - (Examples: Best Wishes Always, The Walker Family; With Love Always, Mom; etc." Please look at the above design in order to determine a suitable poem length. We suggest your poem is no longer than 12 lines with no more than 12 words in each line. There are no set guidelines; this is just a suggestion. If your poem is much longer than the length we are suggesting, the font/type will need to be made smaller to accommodate your entire poem. On the order form, please make sure to type your email address that you check often and phone number in case the designer needs to reach you with any questions. Unless you have permission from the author or poet, please only submit non-copyrighted materials. I like how it turned out. Didn't know by the pictures online if it would look high quality in person or not. The quality is Very nice. Glad I decided to purchase one for my daughter for her wedding day! Absolutely love the way my personalized poem came out for my husband. I had a couple of questions for one of the designers, which i had left a message for and a response was given almost immediately thereafter. they were attentive and caring, and showed a real passion for the work they do. I would highly recommend. The frame looks larger than I thought it would, which is great. The background is beautiful and I love the ability to change the picture. The best part is that I was able to use a poem of my choosing to truelly make it one of a kind.